I collaborated with Daniel McManus and Sofya Karash of The Narrative to create a poster for the film “Bagatelle”—an art-house social satire. I created a detailed full scale illustration, and The Narrative provided art direction and created the final typographic treatment and poster design—emphasizing the dualities in the film, namely the contrast between rural Texas and the world of classical music. 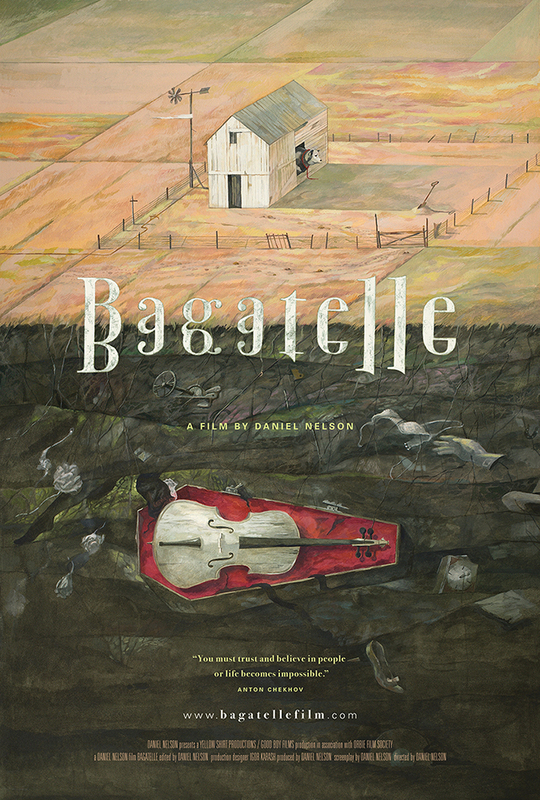 The poster is visually dissected into two parts—farmland and a barn above, and layers of dark textured ground below in which a cello is buried like a casket. The poster relates the desperate and unnerving state of the main character through symbolism and detail. The poster was designed to be effective at a macro and micro scale—the forms of the house, cello, and film title are clearly visible from afar but upon closer inspection additional details create an even richer visual experience, enticing and rewarding viewers for taking a closer look.